As the work of the Farm Bill conference committee progresses, two issues, SNAP and conservation, have been singled out as key to the committee’s success. Today’s update looks briefly at recent news items that contain lawmaker perspective on these two issues. House Agriculture Committee Ranking Member Collin Peterson (D., Minn.) was a guest on Friday’s “Adams on Agriculture” radio program with Mike Adams. Rep. Peterson noted that, “Well, there’s a lot going on. The staff’s been very heavily engaged. They’re working every day, all day long, and into the early evening. We had a conference call yesterday. It was the second one between the four of us, and it went well. And everybody is, you know, totally committed to getting this thing done by September 30th, so we laid out kind of where we’re at and where some of the issues are. We’re going to have the, apparently the public meeting is going to be on September 5th. “And we’re making very good progress in a number of the titles. A number of them are close to being worked out. Chairman Conaway, I think rightly, brought up the situation that probably the two issues that are going to require some work are going to be obviously nutrition and also conservation, and the overall money situation. So it was unclear to me how those issues are going to get resolved. But everybody says we’re going to get them resolved, so we’ll see what happens. More narrowly on the nutrition issue, Rep. Peterson pointed out that, “The nutrition thing, you know, which caused us a lot of problem in the House, what I’m doing with that is I’m really backing out of that whole discussion, and I’ve just told Chairman Conaway that whatever he can work out with the Senate is okay with me. Ranking member Peterson says nutrition, conservation and funding continue to be the big farm bill issues but conference call yesterday with Ag committee leadership went well. Meanwhile, on the Senate floor Thursday, Texas GOP Senator John Cornyn stated that, “Although I was proud to support the Senate’s version of the [Farm Bill] legislation, I was somewhat disappointed that it did not include stronger reforms to some of these nutrition programs, including work requirements for people who are able-bodied, or training requirements for people who need additional training, or community service for people who can’t work or don’t want the training but at least provide some service to their local communities. 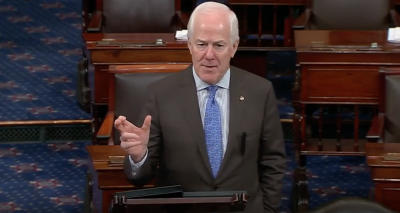 On Thursday, Texas GOP Senator John Cornyn discussed the Farm Bill on the Senate floor. “Mr. Trump at one point was expected to threaten to veto a bill without the tighter work requirements, but lawmakers said he has yet to deliver such a warning,” the Journal article said. Rep. Peterson also indicted that, “I think for us the real deadline is September 30th, which means we have to have this worked out probably by the middle of September so we can get the drafting done and get it to the President’s desk on time. But the problem is if we wait and we don’t get it done by September 30th, then we’ve got to deal with an extension. A recent Congressional Research Service report provided an overview of the Agricultural appropriations bill, which funds the U.S. Department of Agriculture, except for the Forest Service, and is compromised mostly of mandatory spending set by law.